In this moving picture book, award-winning collaborators Davide Cali and Serge Bloch present a fable for our time about two lonely soldiers facing each other across a barren battlefield. What each discovers, as the story unfolds, is that the enemy is not a faceless beast, but rather a real person with family, friends, and dreams. 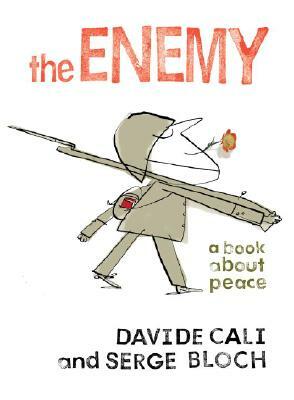 Davide Cali is the author of 12 illustrated books for adults and children, including "I Can't Wait "(illustrated by Serge Bloch), which was an ALA Batchelder Honor Book and also received France's Baobab Award for Best Children's Book of the Year. He lives in Genoa, Italy. Serge Bloch is an artist whose work appears regularly in "The Washington Post, The Wall Street Journal, The Chicago Tribune, The New York Times, "and "The Los Angeles Times," He recently received a Gold Medal from the Society of Illustrators, the ALA Batchelder Honor Award, and France's Baobab Award for the book he created with Davide Cali, "I Can't Wait." He lives in New York, New York. "Poignant, thought-provoking, and powerful in its frankness and simplicity, this short piece will prompt discussion on war and other means of resolving conflict." "Think of it as a kind of 'All Quiet on the Western Front' for the elementary-school set, though with chic, inventive illustration by Serge Bloch."